Dep Rovinj for Losinj in the islands of the Kvarner. No wind. Hot Motor along then stop for swim off Rt Vnetak. Arrive 16:00 and take berth on floating docks at end of harbour 560 KN. Lots of space when we arrive but quite busy by 19:00. 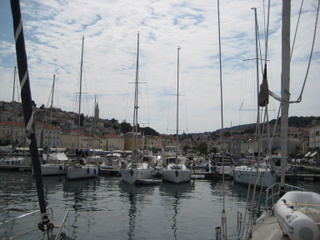 Losinj is much more built up then we expected. It has a commercial dry dock and a bit of industry but mostly appears to be a popular holiday home spot for Italians. Nice town with good restaurants and food markets. Have dinner at Barakuda just beside marina. Decide to have Scorpionfish which is excellent. Oven cooked with roast potatoes and onions. Rather expensive at 800 kn /$160 for the fish alone. Mags thinks it the best she's had in Croatia.